Fine Gael TD John Deasy has identified former Garda Commissioner Martin Callinan as the senior garda he alleges warned him about garda whistleblower Maurice McCabe. Mr Deasy told the Disclosures Tribunal that Mr Callinan told him that Mr McCabe was not to be believed and was not to be trusted on anything. He said he thought Mr Callinan was trying to influence the penalty points issue. 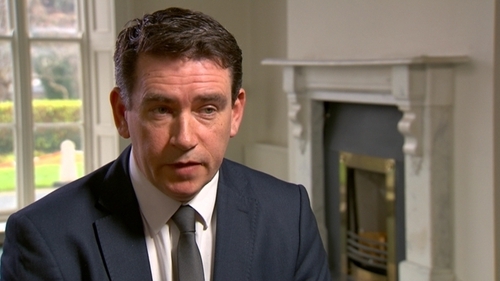 Mr Deasy said he could not believe the then Garda Commissioner would make such comments about a serving garda, and said they had lost control of their own behaviour by addressing committee members like him. The TD gave an interview last year to RTÉ's Prime Time programme where he said "a senior garda" had made a serious attack on Mr McCabe at the time of the Public Accounts Committee's hearings on penalty points. Mr Deasy said today that Mr Callinan made the comments to him just before his appearance at the committee. Mr Callinan has denied making the remarks and told the tribunal that he indicated to Mr Deasy that the committee would have to be mindful of the fact that not all Mr McCabe's allegations were correct as highlighted in an internal garda report. Mr Deasy said he did not think that Mr McCabe got everything right but he was genuine and credible. Under cross-examination by lawyers for Mr Callinan, Mr Deasy said he was not mixing up evidence. Fianna Fáil TD John McGuinness has rejected suggestions by lawyers for Mr Callinan that he was confused about many details in his account of a meeting where he alleges Mr Callinan told him Sgt McCabe abused his own family. The tribunal is examining what transpired at a meeting between the two in a hotel car park on 23 January 2014. Yesterday, Mr McGuinness told the tribunal that Mr Callinan told him during a conversation on 24 January 2014, that Sgt McCabe had sexually abused his own family. Mr Callinan accepts that the meeting took place but denies making the comments attributed to him. Mr McGuinness told the tribunal that he had put as accurately as he could the events and discussions of the time. During cross-examination Mícheál O'Higgins, counsel for Mr Callinan, put it to Mr McGuinness that he was confused over when he made a note of the meeting. Mr McGuinness replied: "You're confused, I'm happy to clear it up for you." He said he was not going to be pulled around on minor details and he had a reputation to protect. He was challenged about contradictory accounts he gave in radio interviews about the encounter when he said he had not recorded a note of the meeting and he had not told his party leader Mícheál Martin. Mr McGuinness said interviews had to be taken in context but the tribunal gave him the opportunity to explain clearly and in truth what happened. He said it was true to say there were parts he had forgotten, but he said he had recorded it as best he could. Mr O'Higgins suggested to Mr McGuinness that the reason Mr Callinan sought out the meeting was that there was still a live issue to be decided over whether Sgt McCabe would give evidence in public or private at the Public Accounts Committee. Mr McGuinness said it was not the case that Mr Callinan raised that point with him. He was also asked why he did not disclose the meeting earlier, particularly at the time when then transport minister Leo Varadkar described the actions of whistleblowers as "distinguished". Mr McGuinness rejected a suggestion that Mr Varadkar had "stolen a march" on other politicians. He said the comments came from "a brave politician, a senior individual in the political system" and the remark was a break for Sgt McCabe. Mr McGuinness was questioned about a handwritten note he made after pulling in from driving home following the meeting with Mr Callinan. Mr O'Higgins asked Mr McGuinness why he did not write the note there and then in the car park. Mr McGuinness said that after meeting the commissioner in the front seat of his car in a car park, and being told the things he had been told, his first instinct was to "get the hell out of there". He said he was deeply upset over what he had been told and wanted to reflect on it. Mr McGuinness was questioned about why he waited until May 2016 to speak about the car park meeting that had taken place over two years earlier. He said he had decided that what was told to him in the car park was wrong and was to serve the purpose of ensuring the Oireachtas Public Accounts Committee hearing on the penalty points issue would not go ahead. He said it was becoming clear around February 2014 that Sgt McCabe and his family were not in a position to take much more. Mr McGuinness said he raised it during a Dáil contribution on 26 May 2016 to correct a wrong and to outline what he believed was an attempt to smear Sgt McCabe's name and discredit him. Mr O’Higgins put it to Mr McGuinness that he would have needed to consult his note of the meeting before speaking about it in the Dáil. Mr McGuinness said he did not have to consult the note as he was living through it and recalled generally what was said by Mr Callinan. He said he never thought of the note until he came across it in the search for information for this tribunal. Mr McGuinness was asked about an interview with RTÉ's This Week programme on 29 May 2016, during which he said he did not record or take notes of the car park meeting. The Fianna Fáil TD told the tribunal that he had not recorded the meeting or written out full notes and that the context of the interview question was relating to full detail of the meeting. Mr McGuinness said he did not deliberately withhold from interviewer Richard Crowley that he had made a note of the meeting. The tribunal saw a transcript of the interview, which showed Mr McGuinness had said he had not told Mr Martin about the car park meeting. Yesterday, the tribunal saw a copy of a letter written to the tribunal by Mr Martin, which stated that Mr McGuinness had told him about the car park meeting and what he alleged Mr Callinan said in February 2014. Mr McGuinness told the tribunal he did not recollect telling Mr Martin about the car park meeting until he saw the Fianna Fáil leader's letter to the tribunal. The Disclosures Tribunal has seen a copy of a text message sent between the former Secretary General of the Department of Justice, Brian Purcell and Mr Callinan which appears to reference the meeting between the then Garda Commissioner and Mr McGuinness. The text, sent on 24 January 2014 from Mr Purcell to Mr Callinan included the words "just wondering how you got in with JMcG." The tribunal also heard that Mr McGuiness’s statement to the tribunal in March 2017 did not include reference to another garda whistleblower, John Wilson. However in a statement in March 2018 following interviews with tribunal investigators, Mr McGuinness said that in the same conversation Mr Callinan had told a story about Mr Wilson. Mr O'Higgins put it to Mr McGuinness that he included the John Wilson reference as a reaction after Mr Callinan in his statement claimed that Mr McGuinness had made a derogatory remark about Mr Wilson. The Fianna Fáil TD said that during the discussion with tribunal investigators, he had put the overall commentary in context and explained how the conversation started and how it led into remarks about Mr McCabe. Mr McGuinness rejected suggestions that he appeared to be offering different accounts of what he claimed Mr Callinan had said. Mr Callinan denies making the remarks about the whistleblowers attributed to him after the PAC meeting, and the comments Mr McGuinness claims he made about Mr McCabe in a hotel car park the following day. Mr McGuinness has finished giving evidence to the Disclosures Tribunal.